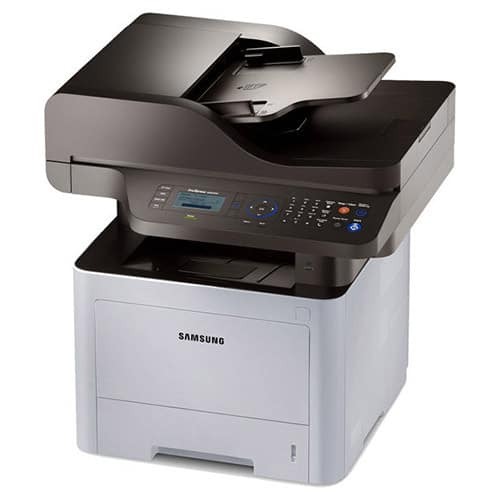 Samsung M3870FW B&W Multifunction ProXpress - Perfecta Business Services, Inc. Most businesses are increasingly demanding high productivity and lower operating costs from their printers. Ease of use and printing. Versatility for a wide range of documents and presentations are also needed. The ProXpress M4070 | 3870 | 3370 series multifunction printers are ideal for every business environment, with a full range of features designed to increase productivity and efficiency. ProXpress M4070 | 3870 | 3370 series MFPs have high print speeds of up to 42 ppm1 (pages per minute) with 256 MB memory for letter size documents. Samsung’s Rendering Engine for Clean Page (ReCP) technology produces sharp text and clear images on a range of media sizes and weights. 4-in-1 multifunctional features and built-in duplex, and convenient mobile printing capabilities come standard. The printers feature enterprise-level security, which offers greater control of user, document, and network access. The M3870FW also features wireless connectivity and Wi-Fi Direct for ultimate ease of sharing. Eco features such as the One Touch Eco Button and Easy Eco Driver plus job accounting help reduce paper, toner, and energy consumption. A wide range of toner cartridges2 supporting different printing volumes aids in lowering the total cost of ownership (TCO).